CRF antibody LS-C11304 is an unconjugated mouse monoclonal antibody to human CRF (CRH). Validated for ELISA and IHC. CRH / CRF antibody was raised against synthetic peptide from human CRH. 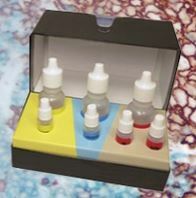 Immunohistochemistry: This product requires protein digestion pre-treatment of paraffin sections e. g. trypsin or pronase. This product requires antigen retrieval using heat treatment prior to staining of paraffin sections. Sodium citrate buffer pH 6.0 is recommended for this purpose. Histology Positive Control Tissue: Human hypothalamus.